The CRP-1389 is similar to the Presidential Miter door, but with a decorative interior framing bead profile. 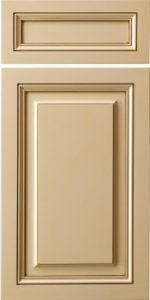 In order to optimize this door for painted finishes, Conestoga (CWS) created the CRP-1389 (MDF) door, which is made of full MDF (Medium Density Fiberboard), uses five-piece construction, and mitered joints. If you need a decorative, mitered door for a painted finish, then consider the CRP-1389 (MDF).